As we mentioned in our previous post, our first humongous priority is de-smoke-ify-ing this house. Which is easier said than done, because over several decades smoke residue sticks to EVERYTHING. 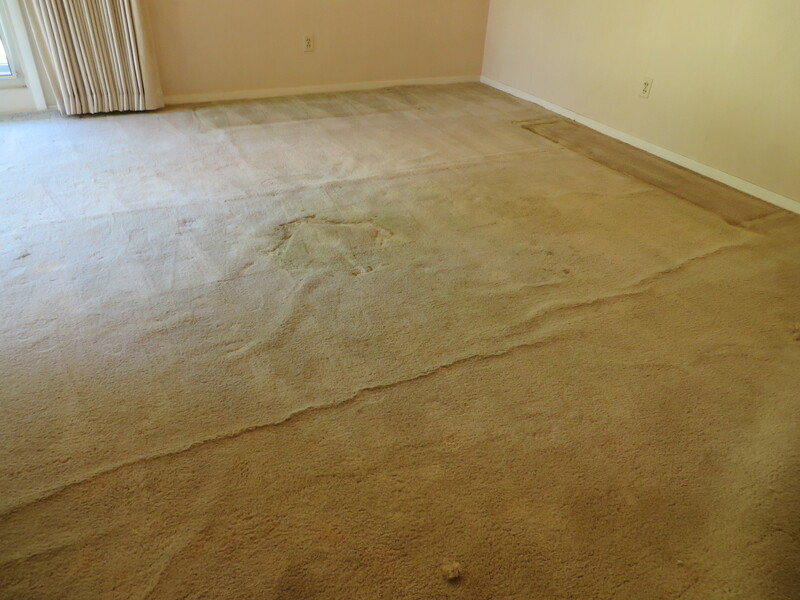 In order to get rid of the stale smoke smell, we need to remove or clean everything we can get our hands on… and the major culprit is the carpet. 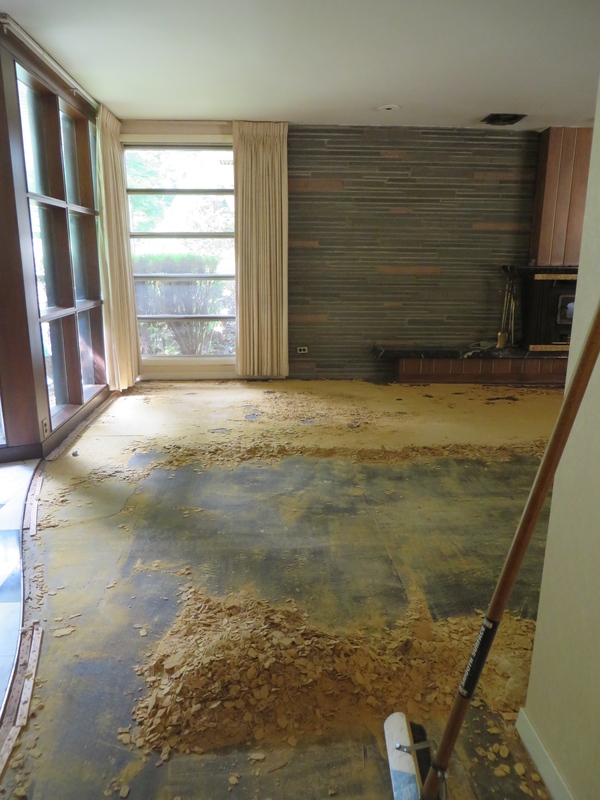 It has to go anyway, smoke or no smoke — it’s several decades old, old enough that the padding underneath turned rotten and caused all of the carpeting to wrinkle and pull. So one hour after we closed on the house, Jack was on his hands and knees with a knife to start with this massive undertaking. 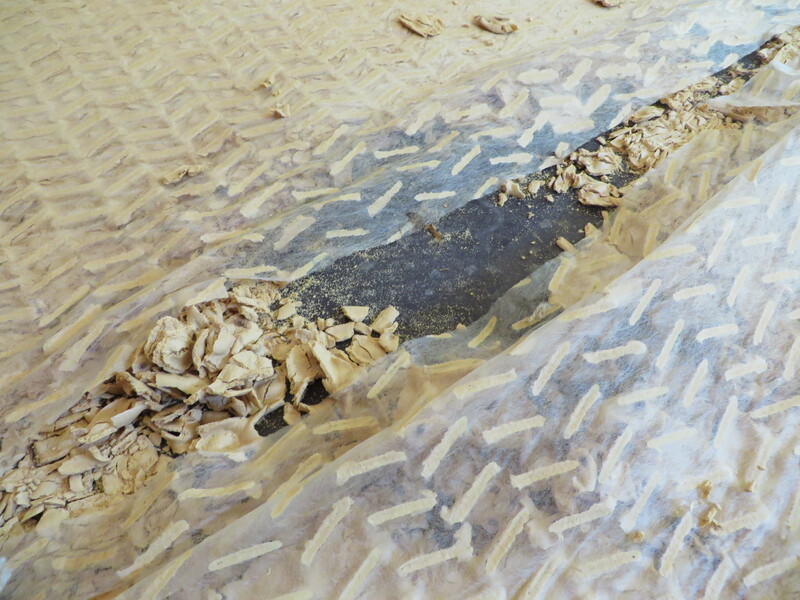 It turns out the padding wasn’t just rotten, it was full-on dried out. Almost every square inch of padding in the entire house (and every room is carpeted except for the kitchen, so that’s a lot of padding) has taken on the consistency of hard crackers. 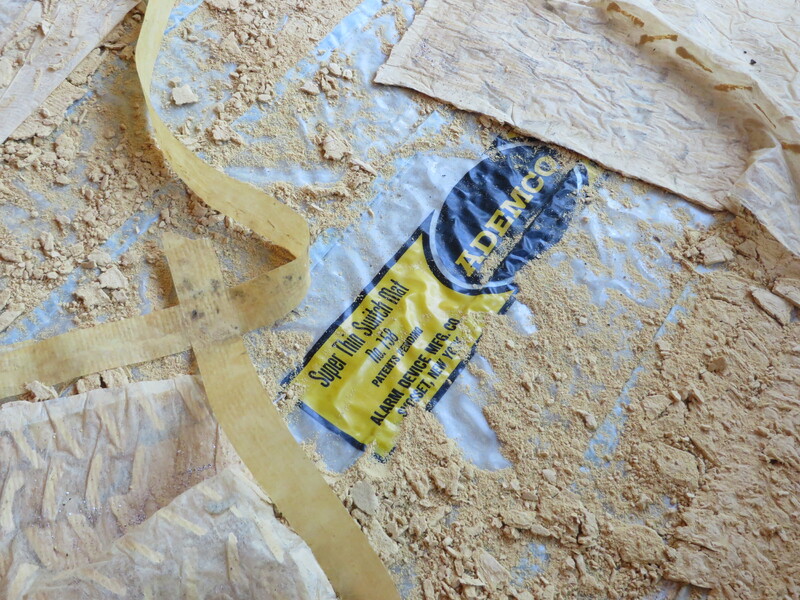 So Jack’s been ripping up the rugs room by room, and then going back with a long-handled floor scraper to dislodge all of the hard stuff that’s stuck to the sub-floor from decades of use. Needless to say, it’s a bit dusty in the house at the moment. 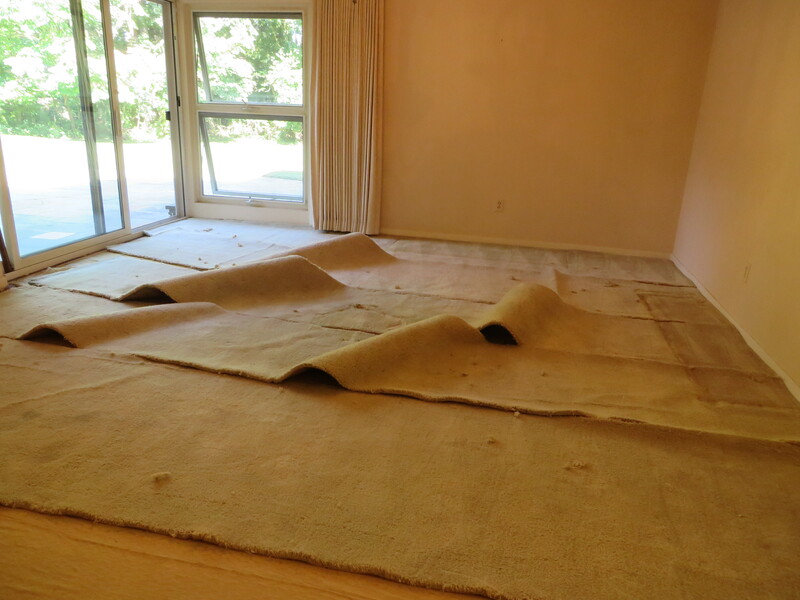 Ripping out the carpets also helped us uncover the source of a problem our inspector had identified in the master bedroom. 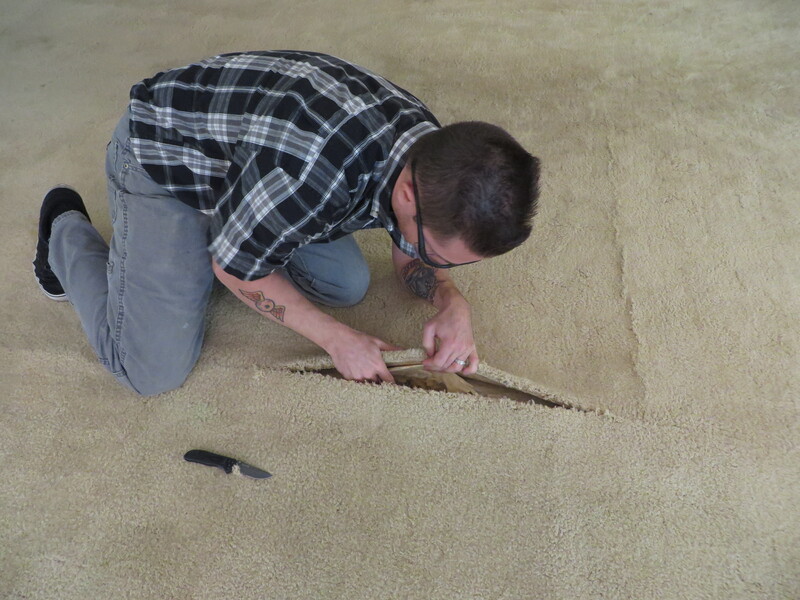 He had noticed that the floor had about a 2-inch slope from the center to the edges, but we couldn’t get to the root of it until we peeled the carpets back. 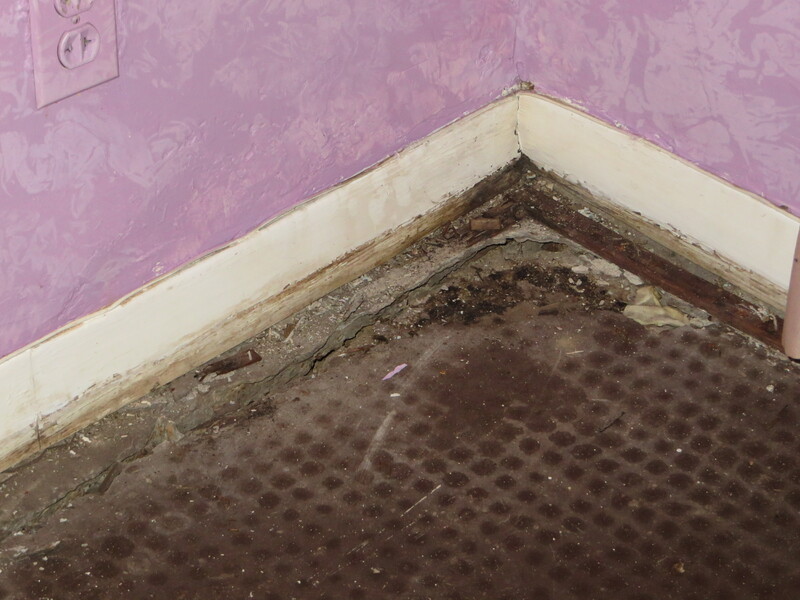 Turns out there is years of water damage in one corner of the room that started to rot the floor and wall away, and messed with the sub-floor. 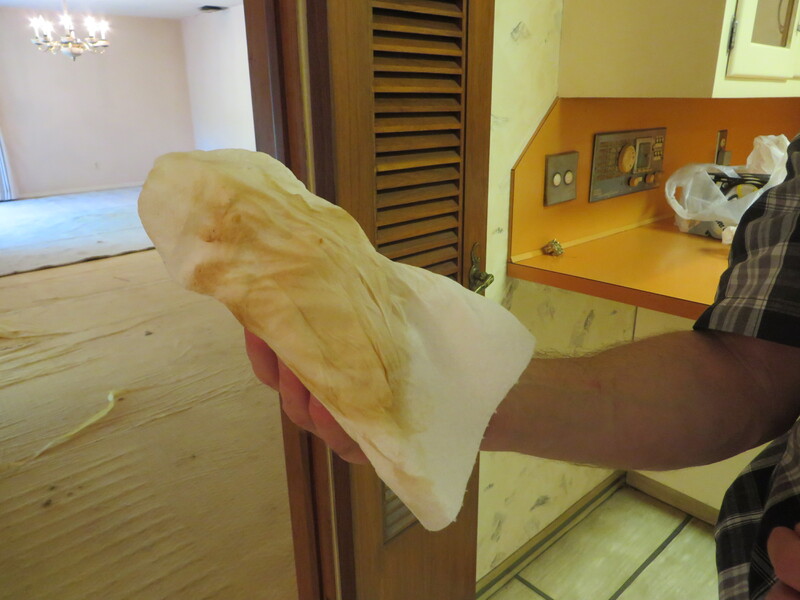 Add rebuilding that to the list of help we’ll need from our contractor! Not everything we found was negative, though. We discovered a really cool feature of the house that must have been state-of-the-art at the time: alarm sensors on the floor! This house is alarmed to the hilt, with bells and panic buttons and such in every room; the sensors were yet another way to keep them safe. 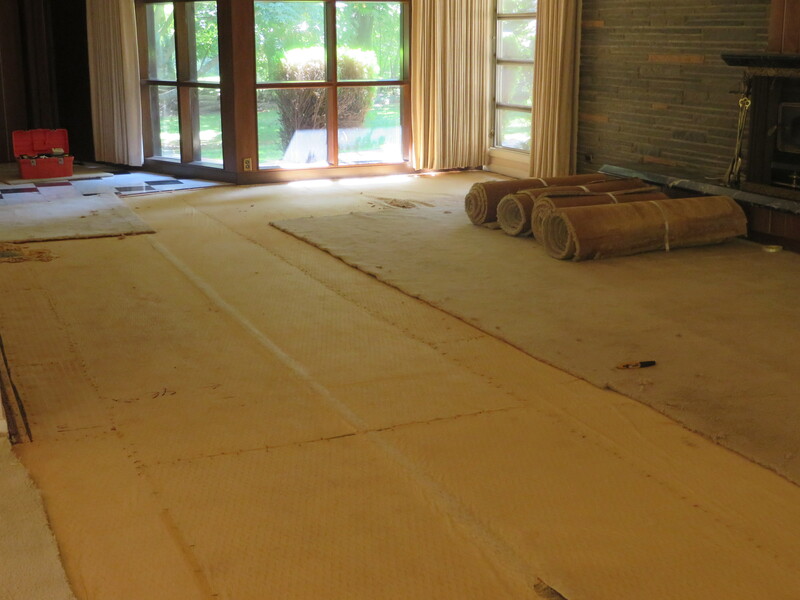 At each doorway, as well as the entrance to several rooms, a wired pad was installed under the carpet padding. If anyone broke into the house, when they stepped on the carpet the weight would trigger the sensors in the pad underneath, and the alarm would go off. Genius! 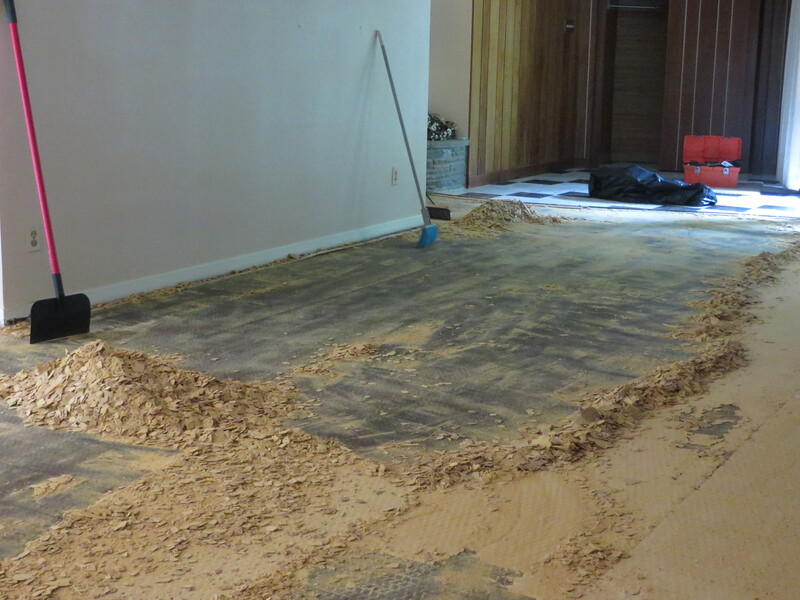 It’ll be a bit before we put down new carpeting, given all the floor-fixing that has to be done first. But once it’s finished, wow will this place look so much better! 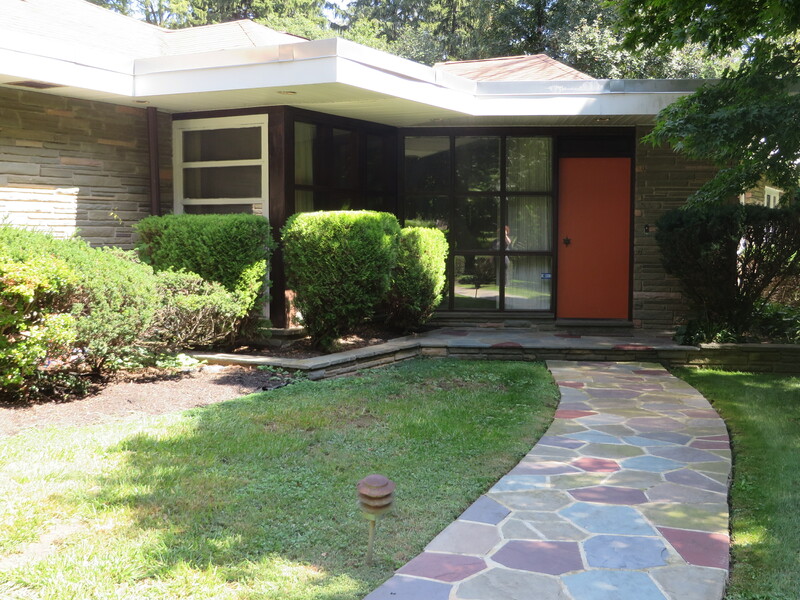 Annnnnnd… we have a house! We couldn’t be more excited about our new home. The past several months leading up to closing were absolutely bonkers, and we almost didn’t buy it… but that’s a post for another time. Right now we just want to focus on giving this house the love and attention it’s needed for a long time, to bring it back to life. It’s such a unique place, we keep pinching ourselves that it’s now ours and we get the chance to do right by it! 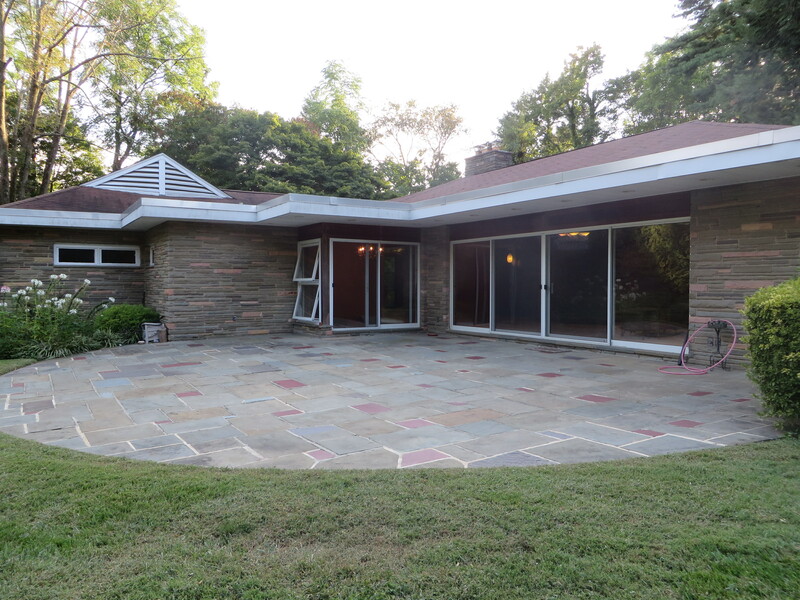 The house was built in 1957, custom-designed for a Philadelphia business owner who supplied appliances and furniture to bars and restaurants. 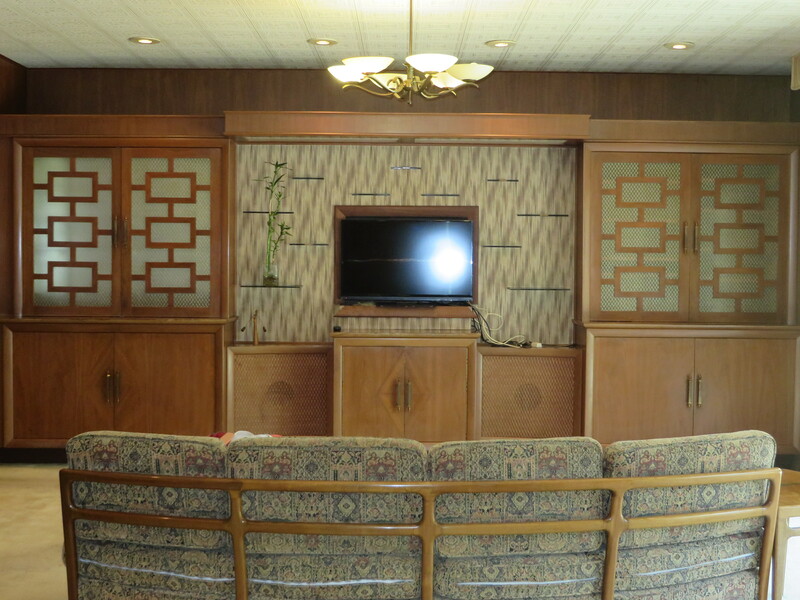 The family room (or “rumpus room” as we’ve started calling it) is what really got us when we first saw this place. 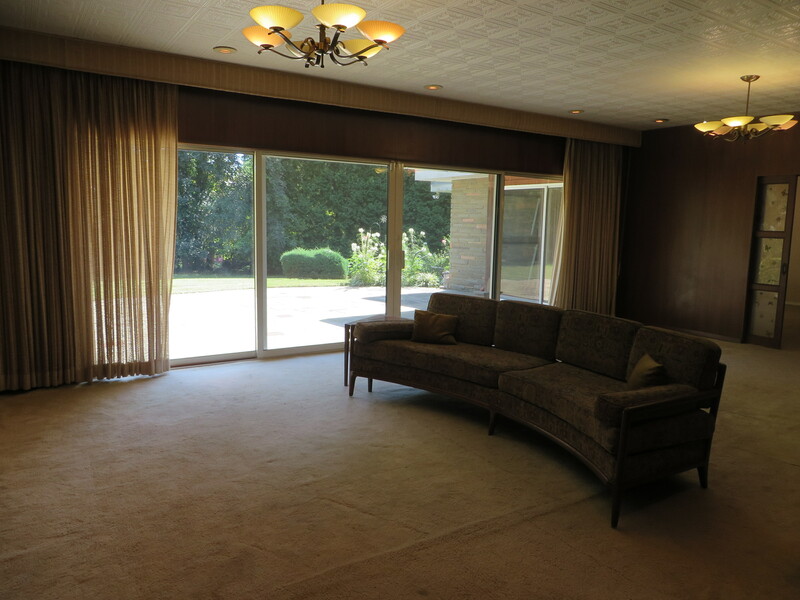 An entire wall of beautiful built-in cabinets, glossy wood paneling, and an amazing view of the backyard through the sliding doors. 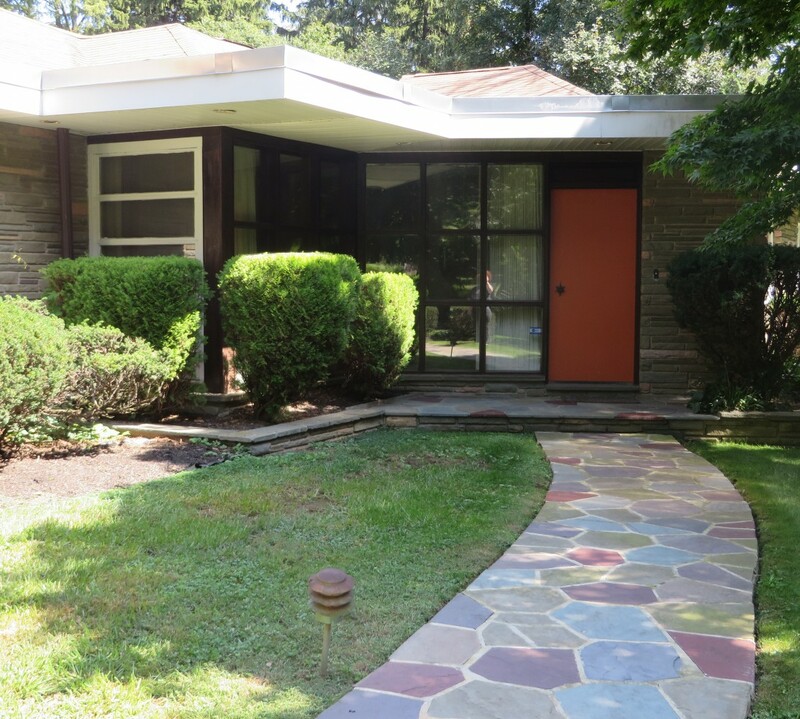 The amazing thing about this house is that the second owners (from whom we purchased the house) didn’t do anything to change it. 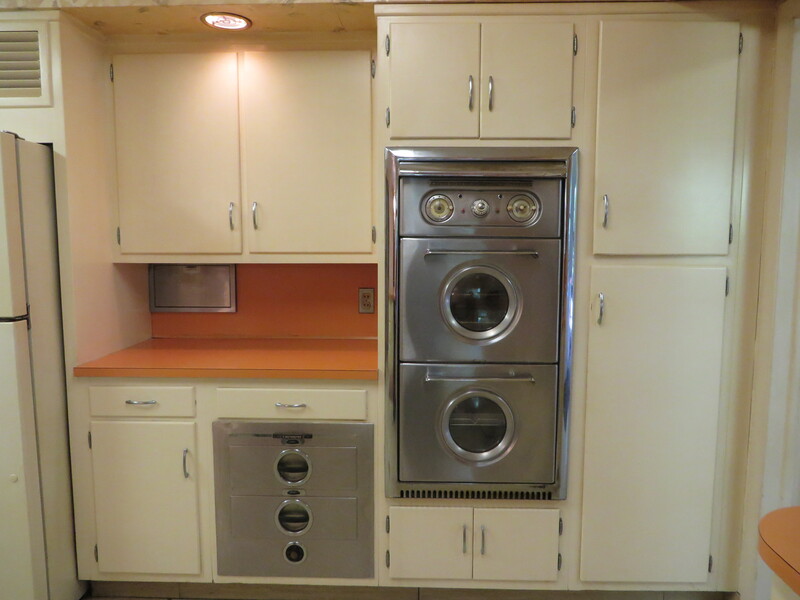 They purchased it in the ’80s, and in 30 years of living in it, they never made the effort to upgrade or customize anything in the entire place. 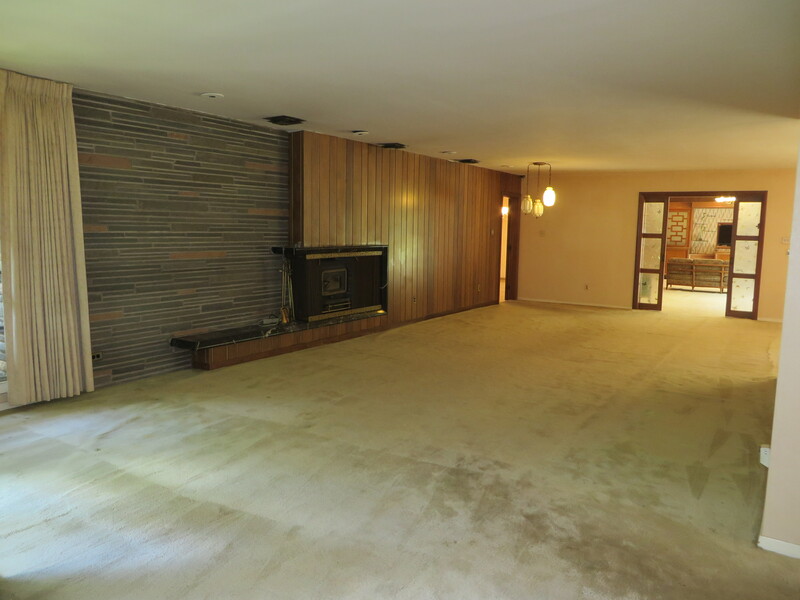 Which means it’s a total time capsule, with pretty much everything in the house original. *squee* I KNOW, RIGHT??? 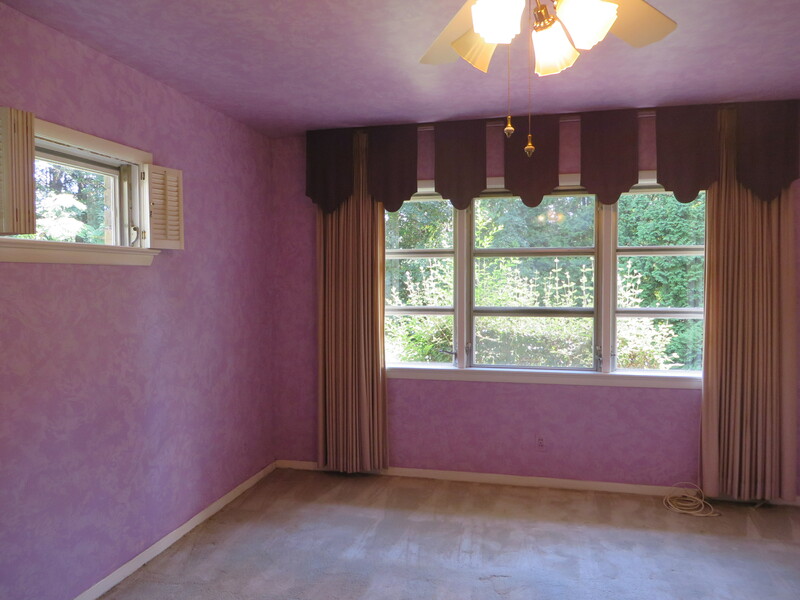 Except the bedroom, which got head-to-toe purple sponge-painted at some point. That will definitely be going away. The upside of having an untouched house is that we get to experience this home the way it was meant to be. The downside is, while none of the decorative elements of the home have been updated, neither have the structural ones. 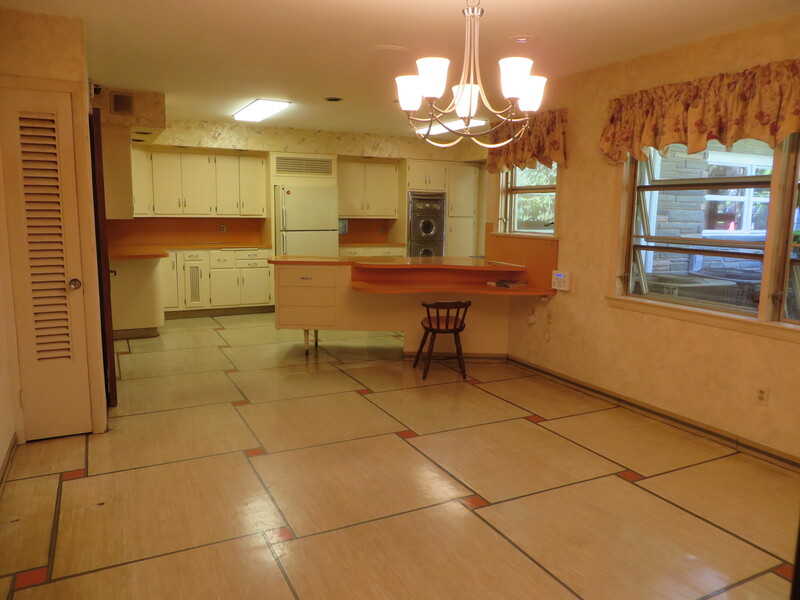 You can’t tell from the photos, but this place needs WORK. So much needs to be fixed in order to keep it safe and livable — the roof, the electrical systems, the chimney, windows, years of hidden water damage, the list goes on. The worst, though, is the SMOKE. We don’t know if the original owners were regular smokers, but the second owners sure were. 30 years of chain smoking have taken their toll… the entire house smells like a dirty, stale ashtray. You walk in the door and the smell punches you in the face. 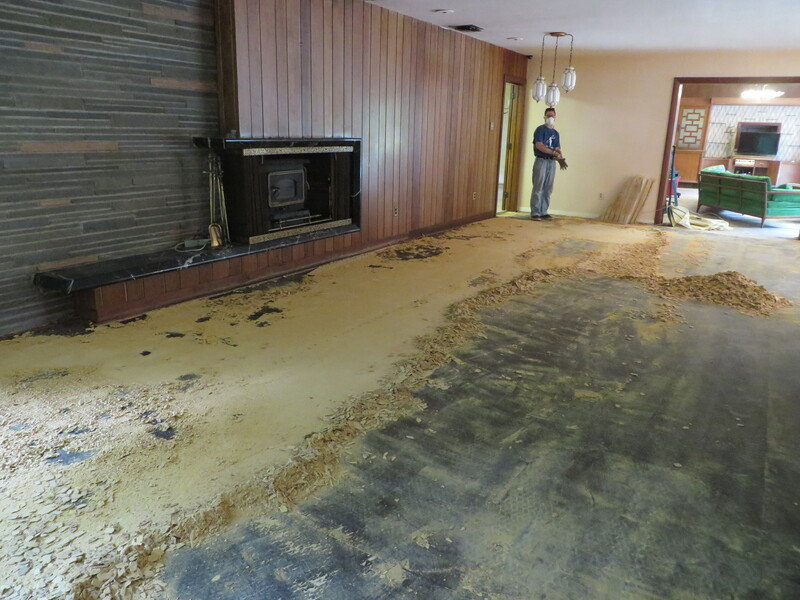 So our first order of business is getting rid of everything that’s holding onto those smoke particles — replacing the carpet and wallpaper, replacing the drapes, cleaning out the duct system, and scrubbing everything else that can be scrubbed. We have a lot of work to do in the coming months, but we’re beyond excited. It took us a long time to find our dream home, and we feel so lucky to be able to take care of such a gem. As we go we’ll post all of the fun details of the house (OMG there are so many!) and a blow-by-blow of what we’re doing to bring it back to its glory. We hope you’ll enjoy reading this as much as we’ll enjoy tracking our progress!